Transform the afternoon sun into a glittering work of art with this stained glass design. Transform the afternoon sun into a glittering work of art with Chanda Froehle's gorgeous mosaic. Blending a bright mix of recycled safety and stained glass and second hand store finds, Chanda uses traditional techniques to hand cut the glass before she affixes the individual pieces to the frame. The result is a lustrous landscape of poppies that spring to life with just a little light. Simply lean against the window and enjoy the bright, changing display. Handmade in Kentucky. 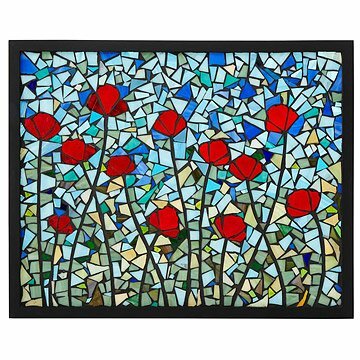 Chanda Froehle is a self-taught artist, specializing in stained glass mosaic work. Her work is exhibited at Edenside Gallery in Louisville KY, and at The Art House in Ft. Thomas KY. Most of her work revolves around the shapes, colors, and textures found in nature. Chanda Froehle lives and works in Louisville, KY with her husband and children. Read a Q&A with Chanda. Clean gently with soft, nonabrasive cloth and glass cleaner. A beautiful piece of art, but what you get is not what you were sold here. Here, the poppies panel is depicted with a beautiful green-dominant lower third evocative of grass, and an upper 2/3rds of the background with bluish tones evocative of sky. What we received was a panel with the green and blue shards strewn throughout the background, with no distinction between upper and lower segments, and the flowers not as beautifully formed as in the image on this page. Sadly, the impression I got from what we received was that it was a rush job. I bought this as a Mother's Day gift for my mom. It's STUNNING. My mother absolutely loved it. After framing, I look forward to enjoying it for many years. I suggest to the artist that she offer the buyer options for framing so that no one will be dissatisfied. It really is a lovely work of art. This panel is gorgeous and I was really excited when I opened it christmas morning. I was confused about how to hang it and didn't realize it's not meant to be hung until I saw the other review and updated description. I was a bit worried about it accidentally falling if I just leaned it, but wanted to give it a try. Unfortunately the bottom glue/grout was coming apart so leaning it the way it is intended would have gravity pulling the glass even more away from the frame until it came out completely. I finally came up with a solution (custom sized metal poster frame that will completely encase the edges while being open in the front and back) and am looking forward to fully installing it. I just wish there had been hanging version as an option when I put it on my wish list. This item looks great and the quality is very good. However, it does not include hardware or screws for hanging and therefore I will need to employ someone to add the proper mounting hardware to hang it or risk doing it myself. The item is very heavy and I am concerned the item will get damaged if not taking to a professional with experience with stained glass. I am disappointed it was not made more clear that this item is not ready for hanging.